December 2010 for the euro vs dollar followed a pattern we have seen for the past 3 years, namely a reversal of trend, high volatility and complete unpredictability with the pair bouncing around the USD1.31 price level and protected by the 200 day moving average. 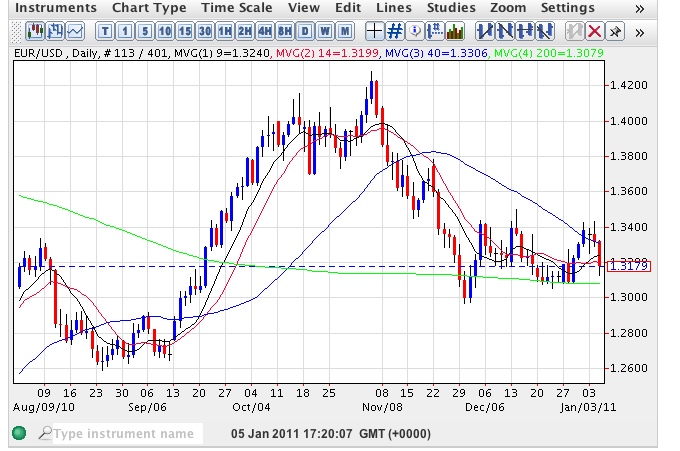 It is this average which is now key to preventing the pair falling back towards the USD1.20 lows of last year. From a fundamental perspective the market’s focus for this week will be US employment data with Friday’s non farm payroll expected to come in at 136k against last month’s previous of 39k. With today’s ADP numbers coming in much better than expected, at 297k against a forecast of 101k should Friday’s data be as dramatic we could see a further resurgence in the US dollar. In addition to NFP the market will also be focusing on Ben Bernanke’s testimony before the Budget Senate Committee and whether the FED is definitely going ahead with the full QE2 programme and begin an aggressive purchase of longer dated T bills. However, given today’s much better than expected employment data & if Friday’s nfp comes in better than expected the market may have to be content with yet more ambivalence.